Deliver your love to your dear ones by sending them this Birthday Selection Gift Hamper with CCD Voucher and see their faces glow with happiness. This Birthday Selection Hamper includes CCD Voucher worth Rs. 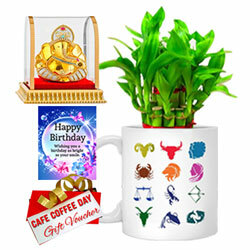 200, Sunsign Coffee Mug, Vignesh Idol, Bamboo Tree and Birthday Card.